As you may be aware, you need an Android smartphone to use an Android Wear smartwatch, but if you carry an Apple iPhone or iPad, you’ll soon be able to use the same Android Wear smartwatch, without relying on unofficial third-party app support. Google is reportedly going to release its a new iOS app over to the App Store that will allow iPhone and iPad users to pair Android Wear devices such as Moto 360 and LG G Watch with their Apple products, French outlet 01net claimed. Google’s new move to go cross-platform with an iOS app would expand support for the wearable platform beyond Android devices and target the potential market of tens of Millions of Apple users that may not be interested in purchasing an Apple Watch. As well as, with lower prices and strong design, a fair amount of Android Wear smartwatch demand would likely be there. The search engine giant is possibly planning to launch the Android Wear app for iOS at Google’s annual developer conference in late May 2015, although the company may push the agenda depending upon the sales of the Apple Watch, which will be launched in the coming weeks. 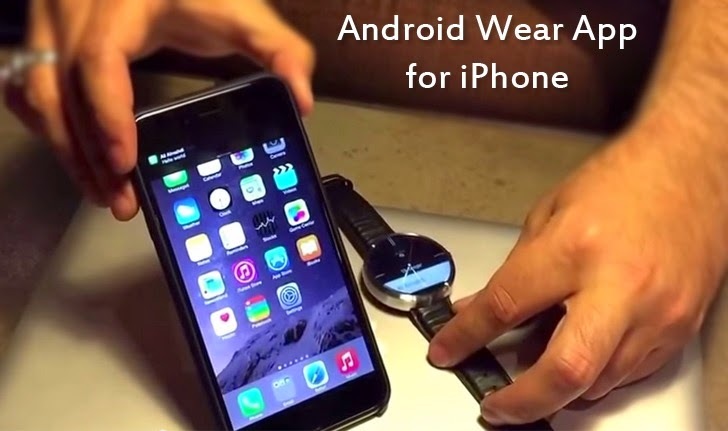 Recently, iOS app developer Ali Almahdi have also made an app that connects iOS to Android Wear device, same what Google is planning to officially launch. In a video submitted to The Hacker News, Almahdi demonstrated the hack on how custom developed iOS app allows his Moto 360 Android Wear smartwatch to sync directly with his iPhone device, without having Jailbreak or root access. GOOGLE TO CLUB WITH APPLE? Right now, I can’t say if Google really be able to convince Apple into approving an Android Wear app for iOS as well as Apple users into using it, but if this happens, it would be highly profitable for both Google and its Android partners. However, much details aren't available yet. But, it would definitely require additional efforts, as it wouldn't be an Android-to-Android connection any more, rather it’s an Android-to-iOS connection. In case, Apple denied approving the Google’s proposal, the search engine giant could partner-up with Microsoft to widespread its Android wearable market. Another Gadget report suggests that Microsoft’s upcoming rumored smartwatch might be compatible with both iOS and Android devices. Google has not yet commented on the matter, but if the rumors turn out to be true, iPhone users would be welcomed to the world of Android Wear for the very first time.